Dozens of choices exist in the weekly ads for the Valentine's Day celebration. 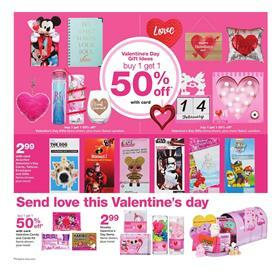 Walgreens Weekly Ad Valentine's Day deals start to appear on the first page. Chocolate boxes, stuffed animal toys, candies, M&M's packs are all on sale. You may see all of these items through this ad. Valentine Candy or chocolate filled hearts will cost $17.99 next week. Also, see good deals in the pharmacy part of the ad. The store offers a mix and match sale in vitamins and supplements category. BOGO Free mix and match sale for Nature's Bounty, Nature Made and Finest Nutrition. Practical external support for your body especially when you exercise or work hard as such you lack the essential vitamins or minerals. Deals of the week are Arm & Hammer laundry detergent, Whitman's or Russell Stover chocolate, and Hershey's or Oreo Milka candy that are on the first page. Walgreens Ad shows the prices of packs of candies from Milk Duds, Nice! Candy, Sugar Free Candy or Chocolate, Nabisco Cookies or Crackers, thinkThin, Kind or Special K and more brands. See these offers on pg 2. You can buy 2 Ty Valentine's Day beanie boos for only $10 at Walgreens Stores next week. The deals will be valid starting on Sunday.